Afrikanet appoints Mr Stephen Oduor, for East Africa operations. We'll welcome on 16/12/2009 after 1 month induction a new Remote Worker Staff, permanent contractor: Mr Stephen Oduor who will be based in NAIROBI KENYA but really mobile, will travel very often in the area. Stephen will act as "Marketing and New Business Development Manager" specially in Eastern Africa but some impact in central and western Africa as well in country such as Cameroon, Ghana, but only work on high revenue PREMIUM NDA customers and partners. 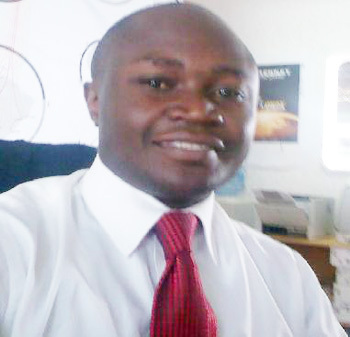 Stephen holds a BA in Economics, Honours from MASENO University in- Kenya and CIM professional Diploma in Marketing. He is member of several organization in that area, including Chartered Institute of Marketing (CIM) and Institute of Economic Affairs (I.E.A). Stephen previously held a Senior Sales position at Barwil Agencies (Subsidiary of Wilh. Wilhelmsen ASA) and an Assistant Marketing Manager role at Afsat Communications an organization that offers VSAT broadband business to over 28 countries in Africa. Strong background in VSATs projects. Stephen will bring his strong background in sales, marketing and product development, SCPC or MESH projects type from international organizations into AFRIKANET to help achieve its partial 2010 goal of leading contribution in bridging digital divide in that Eastern part of Africa. He will attend several conferences and trade show in Africa, to raise AFRIKANET profile and to build a strong VIP network for AFRIKANET 2012 global vision. Commission, control and monitor their own remote sites with less interaction from UK. Easily expand their service capacity as they build customer projects in Africa specially on Star Topology. Afrikanet Oxford Consultech UK Limited is one of the leading telecommunication service providers in Africa. The company was formed in 1999 to provide broadband solutions via satellite for the African Market. Afrikanet Oxford Consultech is headquartered in UK, London Oxford Culham Innovation Center - Science Park - Oxford OX14 3DB, and offers its service through a network of distributors across the Africa continent. Appointing a young qualified, very mobile, dynamic and hungry sales staff from Barak Obama Father's home land with the same spirit of travelling everywhere looking for fortune and fighting for success is a step that will leverage our position in Africa and address this growing market which is nearly recession free>> says Casimir Berthier Fotso, CEO of AFRIKANET. Four locations, each with private LAN, intercommunicating directly with one another. Central location plus three remote offices with corporate/private LAN. I have written this page based on a press release from AfrikaNet. This is not a paid for advertisement.